Any router with 1/2" or 12 mm collet can hook up with this extension with any router bit with shank 6mm, 8 mm. It is designed to extend through the router table with router collet extension, one is to control router cutting depth, the other 1/2" router can work with other sizes of router bits without switching router. Tolerance of its concentricity is controlled under 0.05 mm. 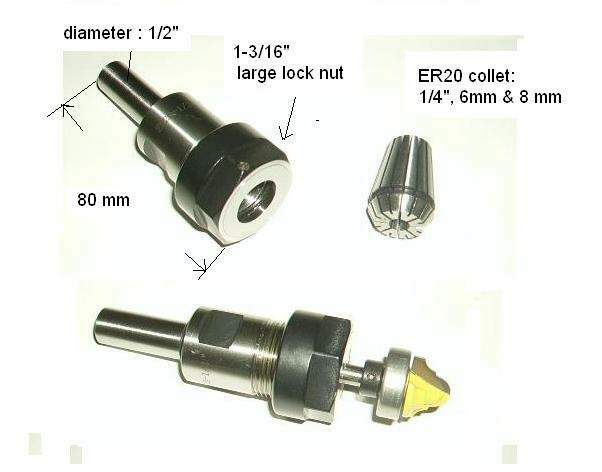 Collet is applied universal ER20, 1/4", 6 mm, 8 mm, 12mm & 1/2" available. Wrenches are included.